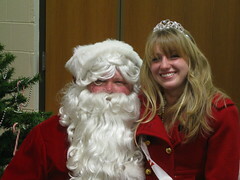 Roselle Public Library and the Village of Roselle welcomed Santa Claus to town on Saturday, November 27. Bill Hooper got everyone is a festive mood as we awaited the arrival, via firetruck, of the jolly elf. Santa lit the tree in Elm Court and then, with the help of the Rose Queen, got down to the serious business of the day; listening to the hopes and wishes of the children. Perhaps we got a picture of you conferring with Santa? Check out the photos on the Library's Flickr site.